This is the yacht you’ve always dreamed Of! The revolutionary superdisplacement hull is the secret behind Greenline’s ability to use less fuel, generate lower Co2 emissions than any comparable boat, and produce less wake. The fuel consumption per nautical mile is less than of a comparable displacement hull on any boat and as little as one quarter of a semi-displacement, twin-engine planing boat or yacht. In a full boating season, Greenline will burn as little fossil fuel as a sailing yacht of the same size and up to 4 times less than a twin-engine planing boat or yacht of the same size. 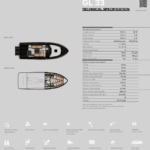 This revolutionary hull on the Greenline yacht efficiently covers the speed range from zero to ver double displacement speed, up to 15 knots, in case of a 10 meter waterline, and up to 20 knots in case of a 12 meter waterline. The newly developed, sailing boat/yacht derived superdisplacement hull (protected) with twin stabilisers has unmatched anti-roll and tracking stability compared to any other yacht or boat. It offers a comfortable and safe ride in all weather conditions, faced by a head-on, side, or following sea. 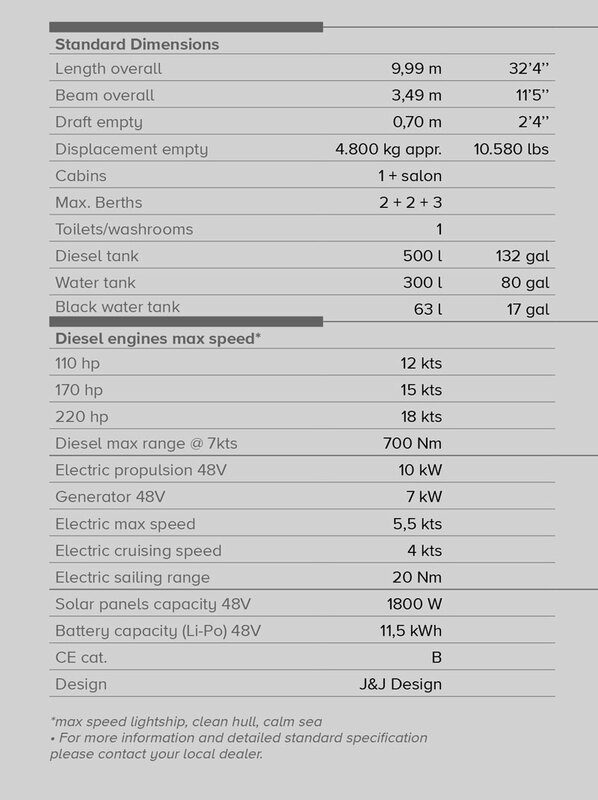 Note: This yacht is available with a diesel-hybrid engine or a diesel-only engine. All models have solar charging. 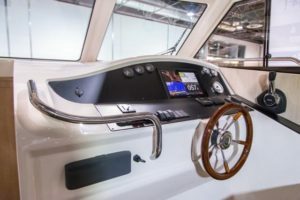 When you combine one of the best insulated engine bays with a modern diesel engine, you get one of the most silent boats on the market today. With nothing more than a whisper-like hum at cruising speed, the Greenline 33 yacht never disturbs your comfort when using either electric or diesel. With large glass surfaces in the salon and the owner’s cabin, the Greenline interior is always full of natural light, offering great visibility and a feeling of connection to the outer world. 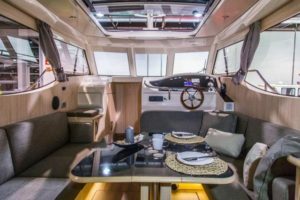 Because the Greenline 33 yacht uses A 230 (120) V Ac internal power supply system, you can recreate the comfort of your own home with a range of home appliances like a refrigerator (there’s room for a 270 litre unit), a microwave oven, Tv’s, computers, and even an A/C unit. These appliances can be brought from home, or bought/exchanged conveniently and affordably. 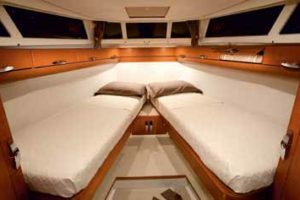 Another benefit to this yacht is found in the owner’s cabin, where the beds can be moved to create single or double berths. The mattresses are standard sized, greatly enhancing sleeping comfort. The standard size is also highly practical when it comes to buying or replacing your bed linen and accessories. 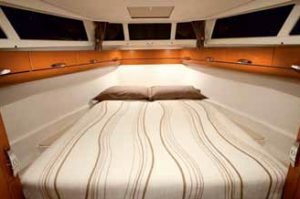 You will no longer want to leave the boat to sleep in a “real” bed. 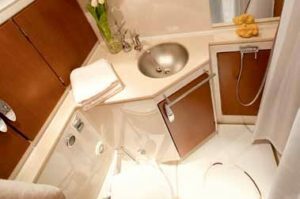 A regular-sized shower and toilet make your boat a home away from home, increasing comfort on prolonged cruises. With separate doors for the owner and guests, both will be able to keep their privacy. 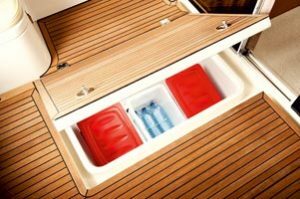 With a large refrigerator, deep freezer, microwave, and classical oven, cooking and food preparation on-board your yacht will become an enjoyable pastime, minimizing the difference in comfort between your home and your boat. 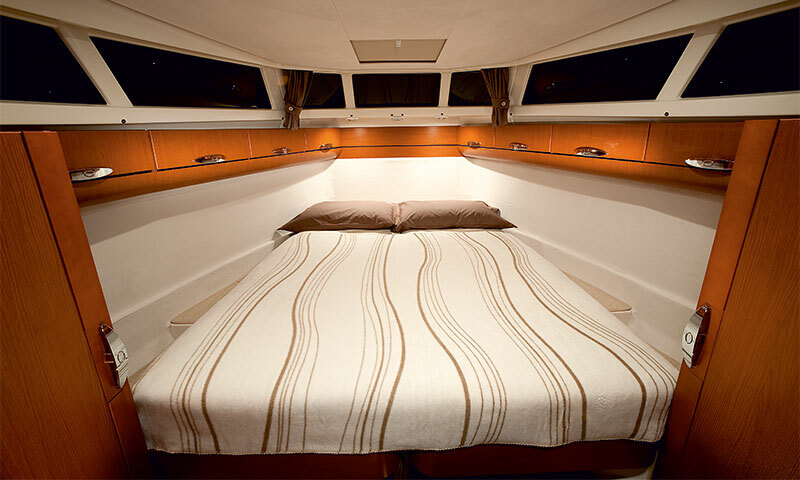 The extended cabin roof gives full protection from the sun, rain, or wind while on your yacht. 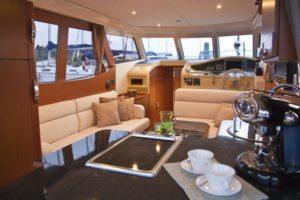 An optional canvas cover can be fitted to fully enclose the cockpit area and extend your boating season when the weather turns colder. Safe and useful when standing at anchor or boat sailing on rainy, cold, or windy days. Deep, covered sidewalks provide additional security while anchoring, mooring, or going to the bow, ensuring that your guests are safe and comfortable. The Greenline 33 yacht features a remote-controlled, electrically opening and closing platform for easy water and dock access. 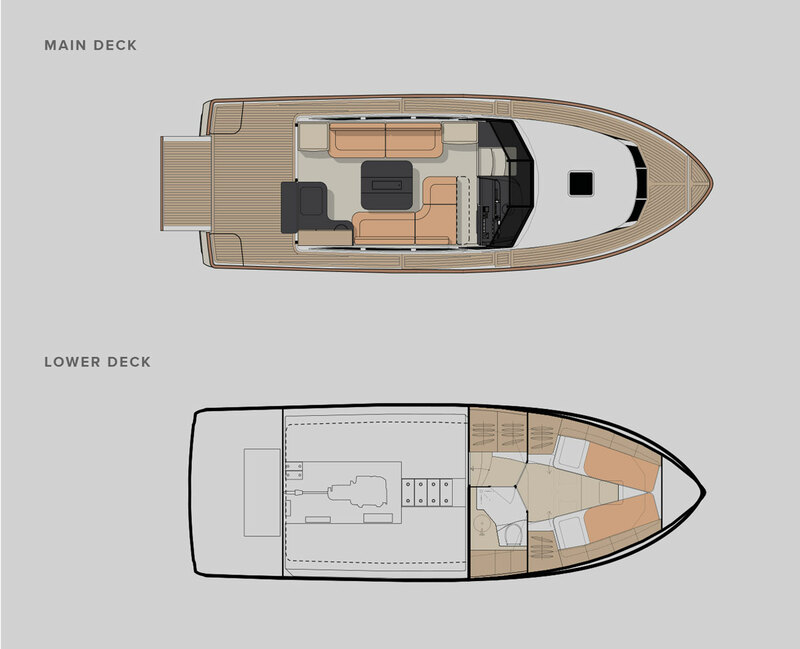 Enlarging the lounge/cockpit area by four squared meters, this option creates the impression of a much more spacious boat. 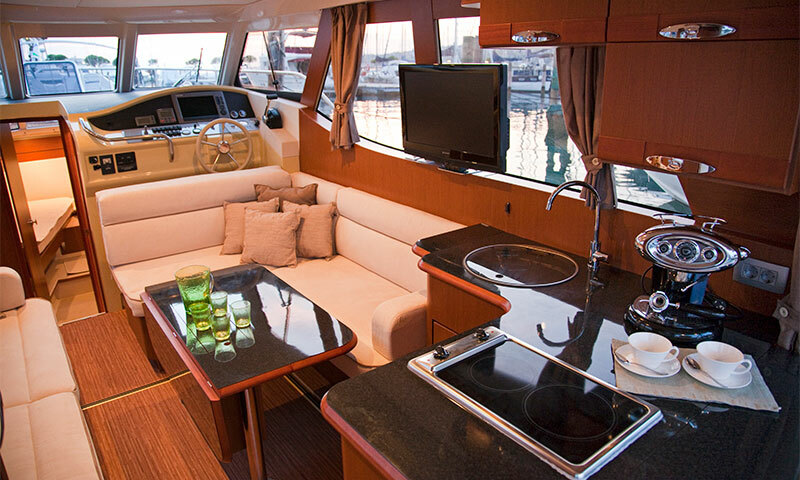 Making life easier when docked side-to, the Greenline 33 yacht has three different entry height levels (stern platform, side exit, bow), allowing you to always visit and leave safely and comfortably. 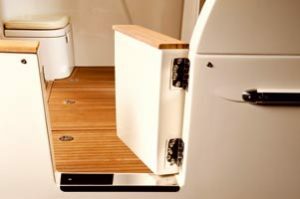 Twin cockpit storage lockers offer all the space needed for your equipment and toys while on your yacht. 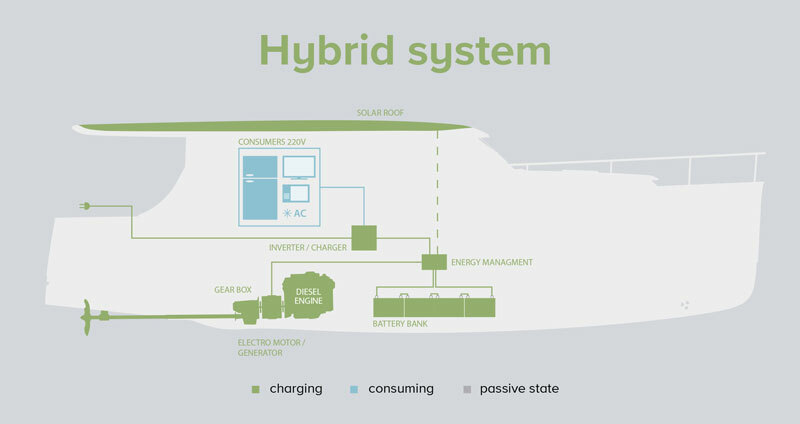 This connects the boat’s water system with the shore water grid – just like the electricity connected to shore power. 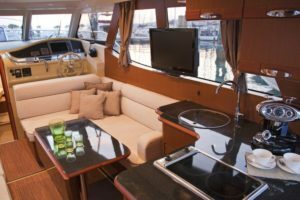 Eliminating the need to operate the water pump and bringing shore pressure to the kitchen tap, this will make the nights quieter, and will make sure your tank is always full when leaving the marina.